HDR10+ Technologies, a joint venture among 20th Century Fox, Panasonic Corp. and Samsung Electronics, has announced the first certified products and first adopters for the loyalty-free HDR10+ license program. Panasonic and Samsung are also among the first to announce firmware has been deployed to select 2018 television models enabling support of HDR10+ for consumers. HDR10+ advances High Dynamic Range (HDR) and HDR10 TV formats by adding dynamic metadata to each frame. It enables advanced chipsets to create a true-to-life picture across a wider range of displays. Depending on the category of adopter, certification can be obtained by self-certification or through an Authorized Testing Center (ATC) such as Allion and TTA — the first centers verified for HDR10+ certification. Adopter categories include UHD Blu-ray player manufacturers, OTT set-top box manufacturers or services, display manufacturers, SoC vendors, content companies and tool vendors. More than 80 companies have already applied or completed the license program. 20th Century Fox has committed to incorporating HDR10+ in its upcoming new release slate. 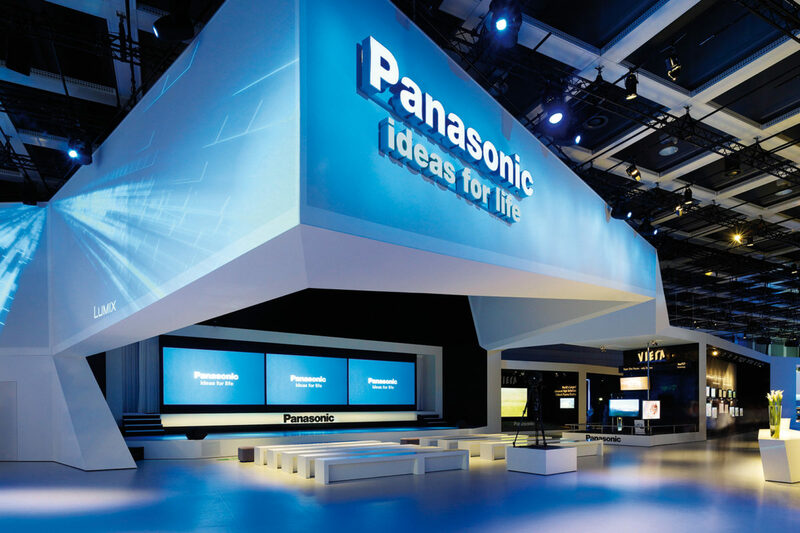 “Panasonic is happy to announce that through the deployment of a firmware update, the majority of our 2018 4K models are now HDR10+ certified meaning that our viewers will be able to enjoy content even closer to the intentions of the filmmakers,” said Toshiharu Tsutsui, director of Panasonic’s TV Business Division, in a statement. More on the certification requirements and application process can be found here. Companies adopting HDR10+ are listed on the website. Companies can learn more about the HDR10+ license and logo program, including final specifications and adopter agreements here. 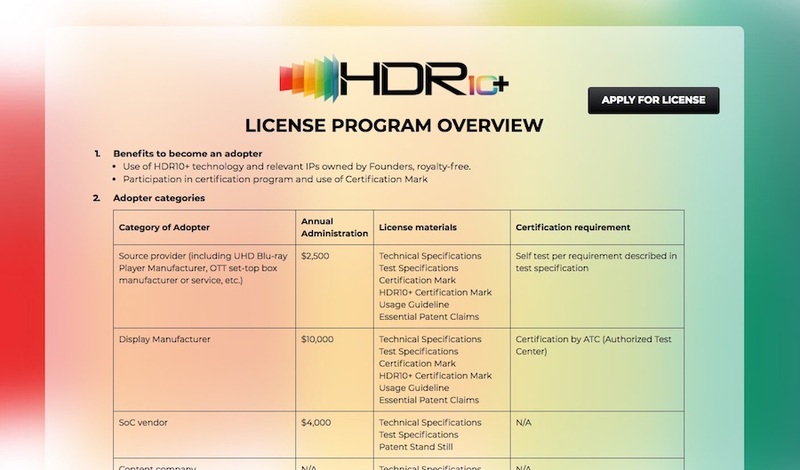 HDR10+ Technologies LLC June 20 announced the start of the new licensing and logo certification program for HDR10+ technology. HDR10+ is the royalty-free, open standard dynamic metadata platform for High Dynamic Range (HDR), which optimizes picture quality for 4K Ultra HD displays and improves the viewing experience for all audiences. The HDR10+ license and logo certification is available to interested companies that meet HDR10+ technical and testing specifications. The HDR10+ certification program qualifies the compliance based on different device categories and their technical performance to ensure that HDR10+ compliant products meet high standards for picture quality. An on-pack HDR10+ logo signifies a product’s certification. The royalty-free adoption of HDR10+ for content production, distribution and consumption currently has more than 40 supporting companies. The HDR10+ platform was also designed to allow for future development and innovation in order to deliver a more powerful technology in the years to come. 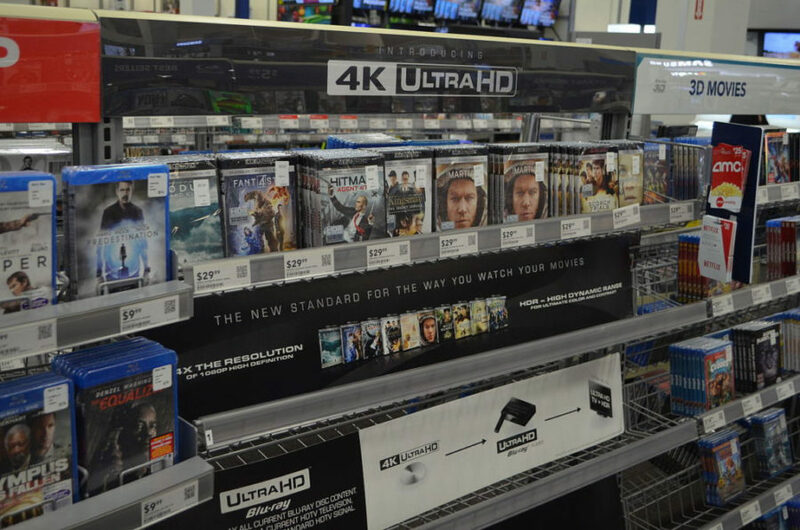 Panasonic could add a second new Ultra HD Blu-ray player to its 2018 U.S. product lineup, according to a report from HD Guru. The new player, model DP-UB9000, announced at a Panasonic Product Convention in Europe last week, could join the previously announced UB820, HD Guru reported. 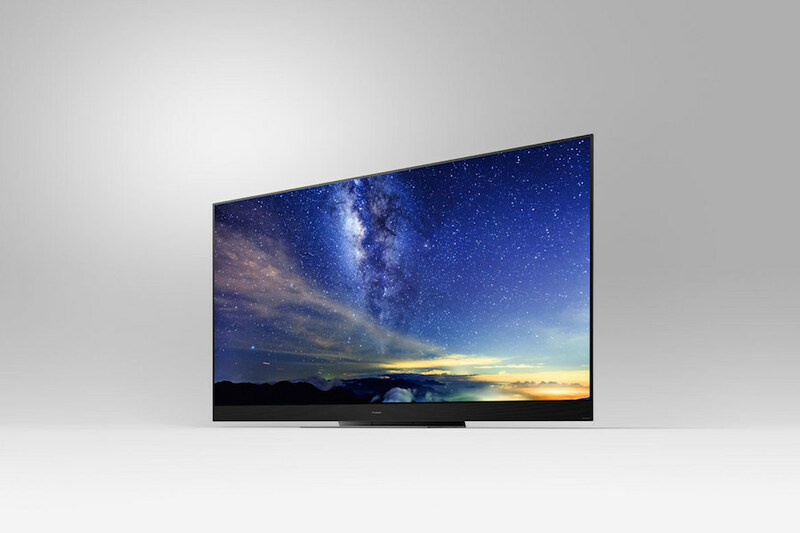 The Panasonic UB820 was unveiled at CES last month, where it won HD Guru’s Best Ultra HD Player of CES 2018 award. In 2016 Panasonic introduced its first premium 4K UHD Blu-ray player, model UB900, in the United States. Panasonic has unveiled four new Ultra HD Blu-ray players offering support for Dolby Vision and/or HDR10+, the royalty-free metadata high dynamic range platform co-created by Samsung, Fox and Panasonic. The players – revealed at a Los Angeles press conference prior to CES 2018 – include the latest generation HCX (Hollywood Cinema Experience) processors (developed at Panasonic Hollywood Laboratory) and voice control technology through Amazon Alexa and Google Assist AI. Models DP-UB320, DP-UB330, DP-UB420 and DP-UB820 feature Ultra HD Premium certification through the Ultra HD Alliance specifications. The HCX processor reportedly reproduces Ultra HD Blu-ray and 4K streamed video images with optimal brightness. The players can also convert full HD to 4K resolution. The HDR10+ supported UB820 and UB420 models add dynamic metadata technology to the basic HDR10 for claimed superior color, tone mapping and highlights on a scene-by-scene basis. For HDTVs without HDR, players include standard dynamic range conversion, which claims to reproduce video images with superior brightness than Blu-ray Disc. The new UHD Blu-ray players are slated to begin shipping in the spring. Prices haven’t been disclosed. Two studios are now backing the proprietary High Dynamic Range platform called HDR10+ that Samsung began pushing last year. Twentieth Century Fox, Panasonic and Samsung Jan. 5 announced updates for the HDR10+ platform. At the same time, Warner Bros. announced it had joined the coalition, as well. 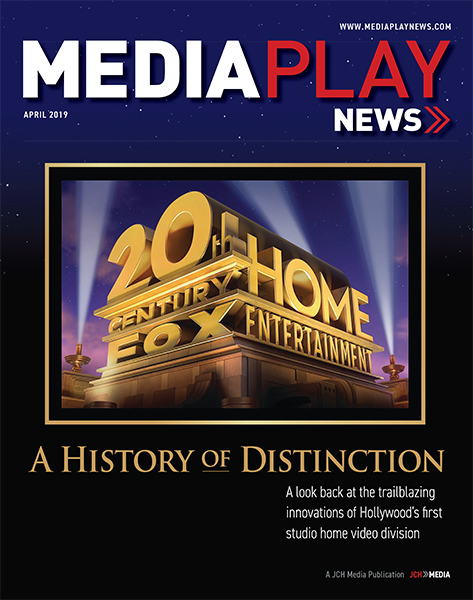 In the move toward advanced 4K ultra high-definition televisions, including higher resolution, frame rates and enhanced contrast, and color, adoption of High Dynamic Range has been limited to paying Dolby Vision or using HDR10 – an open-source format any CE manufacturer can use without paying a licensing fee. The companies envision the updated metadata platform being made available to content companies, UHD TVs, Blu-ray Disc players/recorders and set-top box manufacturers, among others, in the new year. Fox and Samsung begun discussing HDR10+ dynamic metadata in late 2016. 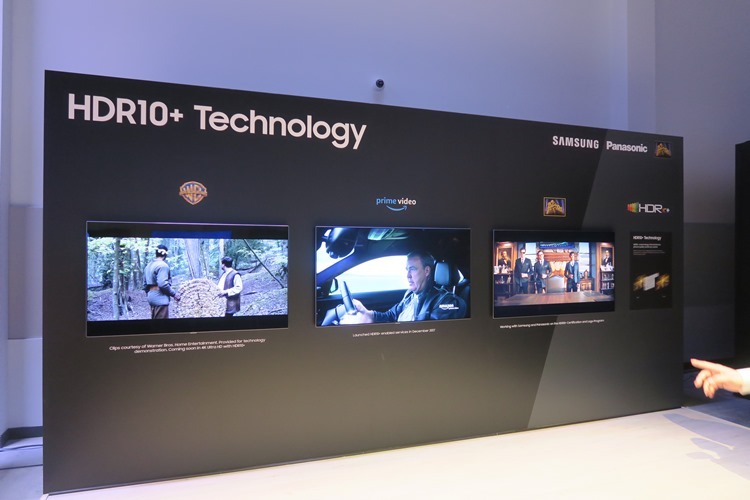 It was in February and March that Fox, Samsung and Panasonic came together to build the licensing program for HDR10+. Samsung and Amazon Prime officially joined the group in April 2017. Warner is the second studio to join. Media reports suggest Netflix is considering implementing the format as well. 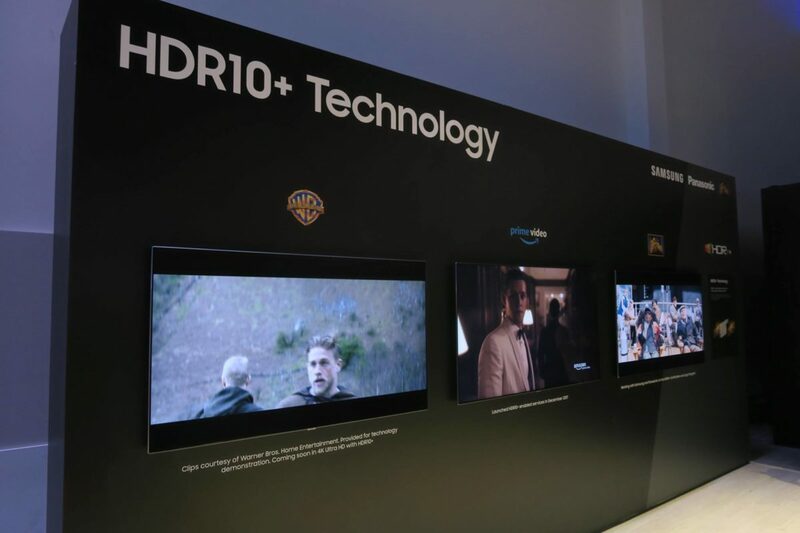 Warner Bros. Home Entertainment says it will support HDR10+ to enable a dynamic metadata solution for Warner Bros. content to Samsung, Panasonic and other HDR10+ capable 4K HDR TVs. Companies attending CES 2018 in Las Vegas Jan. 9-12 can view the new logo, learn about the license program, including final specifications, adopter agreements and/or sign up to receive a notification when technical specifications for HDR10+ become available at http://www.hdr10plus.org. 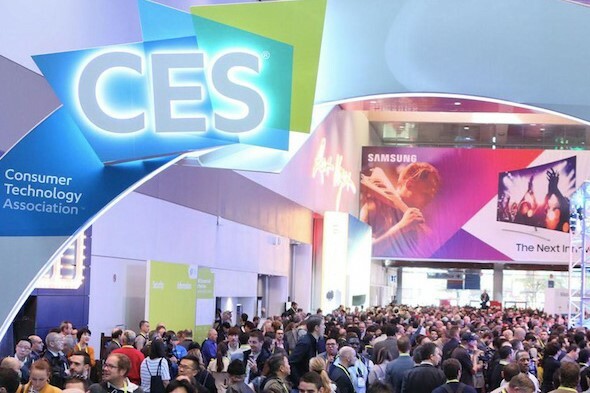 More than 4,000 companies have arrived in Las Vegas for CES 2018, the world’s largest tech show, with many hoping to improve the home entertainment experience. 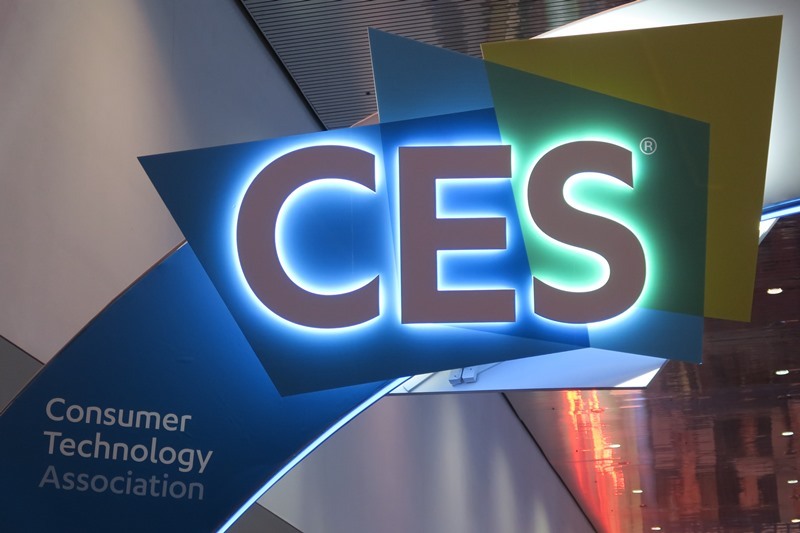 In addition to omnipresent television makers touting larger skinnier 4K UHD displays, CES promises myriad smart home enhancements – many featuring voice-activation. With research firm Gartner predicting that, by 2019, at least 25% of households in developed economies would rely on digital assistants, competition to help people more easily consume anything from pizza to a movie from the comfort of the sofa has become fierce. “Innovations such as voice control have increased consumer interest in solutions that enhance the entertainment experience,” said Elizabeth Parks, SVP at Parks Associates. Google, for example, is coming to CES hoping to up its 25% market share of the smart speaker market, according to Strategy Analytics. Amazon Echo currently commands a 67% market share. Both companies (and Apple) sell digital movies and TV shows, including 2014 sci-fi hit Ex Machina. Seems natural to order the Oscar-winner by voice-command. “You should have the same assistant helping you across all the contexts of your life,” Scott Huffman, VP for Google Assistant, told The Washington Post, whose founder/CEO Jeff Bezos owns Amazon. But what good is virtual assistance if you can’t live forever, looking like George Clooney? Twentieth Century Fox, Panasonic and Samsung will present updates for HDR10+, the open-source High Dynamic Range platform Samsung began pushing last year to avoid paying HDR royalties to Dolby Vision. Amazon Prime Video has already incorporated the enhanced 4K UHD format for original content “Tom Clancy’s Jack Ryan,” comedy “Jean-Claude Van Johnson,” and “The Tick,” among others. Chinese TV manufacturer TCL Jan. 8 will announce plans to join Roku’s “Whole Home Entertainment Licensing Program,” a new platform enabling OEM brands to incorporate voice-activated Roku Connect software as a home entertainment network. TCL manufactures Roku-branded TVs. “Consumers will love the benefits of … having more affordable options – using their voice, having a simplified set up and Wi-Fi connectivity, and holding just one remote control,” said Roku founder/CEO Anthony Wood. Seeking to make sense of it all, Hulu CEO Randy Freer joins Turner CEO John Martin Jan. 10 on a keynote panel titled “Reimagining Television.” Freer and Martin are slated to discuss how technology companies are moving into content creation, while content companies are expanding digital distribution. The panel takes place at Monte Carlo’s Park Theater. Finally, leave it to French furniture maker Miliboo to feature a smart sofa allowing users to wirelessly charge cell phones and related portable devices while watching TV. Even smarter: The sofa tracks how long you’ve been a couch potato, while monitoring the effects on your body’s posture.